Last time, we learned about stratigraphy and the law of superposition. 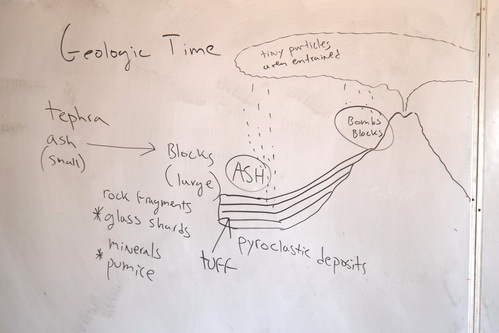 Now the students are going to use this information to come up with a reasonable interpretation of the age of fossils. 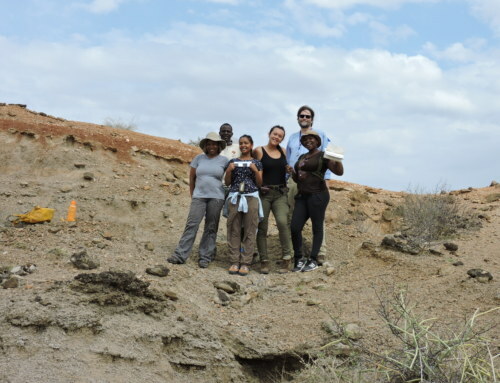 Imagine that we already know the age of a specific layer of sediments in the Turkana Basin. 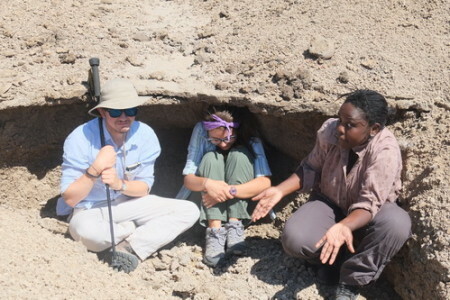 According to the law of superposition, fossils found above this layer should be younger than that age and fossils found below should be older. But how do we know the exact age of that specific layer in the first place? 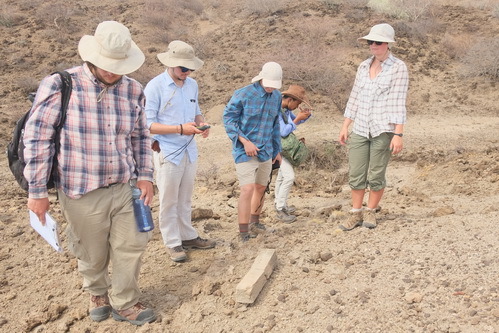 Thankfully, volcanic activity has occurred periodically in East Africa for about the last 30 million years and, has allowed us to use some powerful dating tools in geology. One of the most important methods of geologic dating in the Turkana Basin is radiometric dating, including K/Ar and Ar/Ar dating. 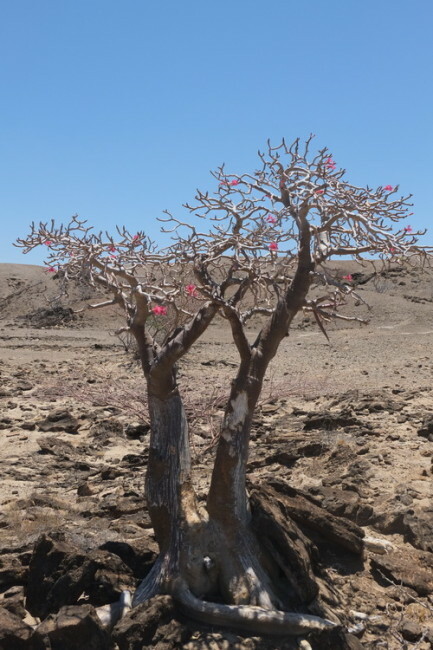 Just like radiocarbon dating, these methods look at how much of the unstable isotopes have decayed over time and therefore, provide a precise age for a specific event. The event in this case, is a volcanic eruption. 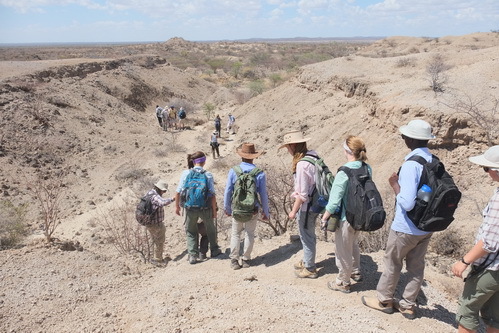 The rifting activity in East Africa created thin areas in the Earth’s crust. As a result, volcanic eruptions were relatively frequent, which shot out layers of ash that were transported and deposited in the Turkana Basin. Buried with the volcanic ash are minerals that contain radioactive Potassium and its decay product Argon gas, which are the targets of radiometric dating. 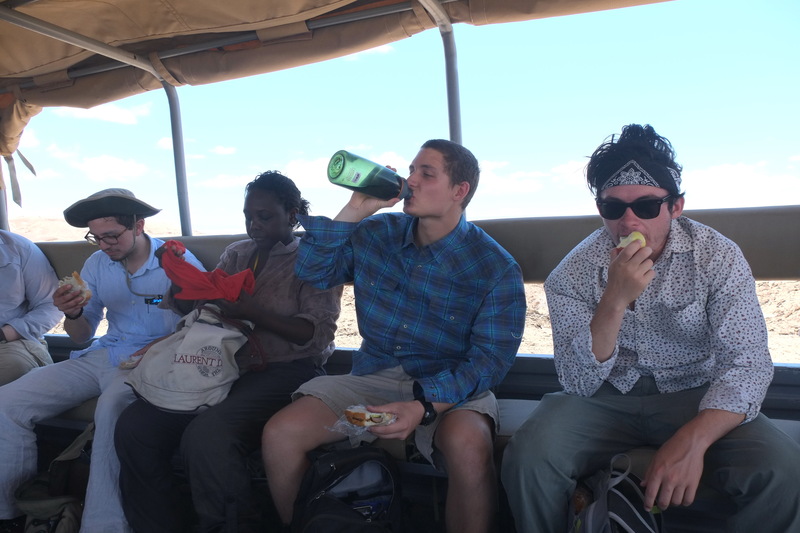 In the lectures, students learned the radioactive process behind the dating methods and how it can help to answer many questions related to evolution. One of the most popular topics is the origin of our genus Homo. 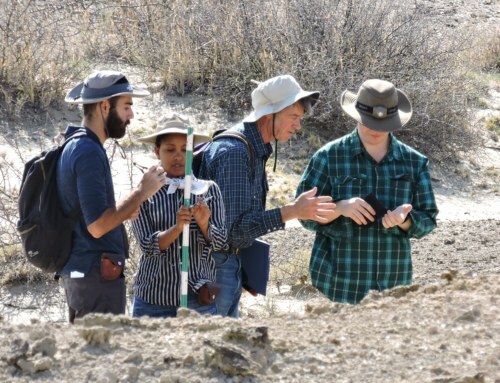 We can imagine when dating methods were not as reliable as they are today, the interpretation of an important fossil find would be greatly altered by its geologic age. 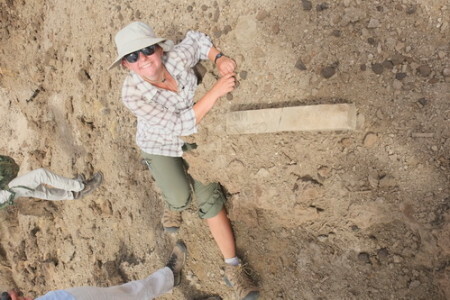 And it did happen to one of the most controversial fossil specimens in the Turkana Basin, known by its museum accession number KNM-ER 1470 (I will refer it as “1470” in the remaining of the blog. Also, take a look at it in 3D on you computer screen!). It was considered a groundbreaking find in the 1970s because it was among the earliest specimens with a relatively large brain size, which was believed to be one of the most important features of our genus. 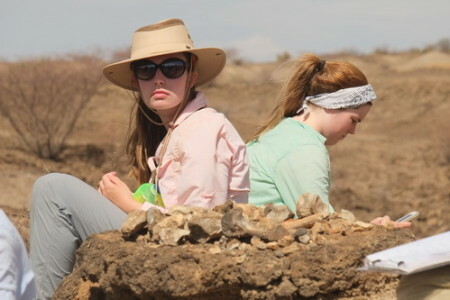 Another important feature would be the ability to produce stone tools and they have been found by Mary Leakey at Olduvai Gorge in Tanzania, which have been dated at about 1.9 million years old. Associated with the tools is the supposed tool maker Homo habilis, but with a brain size about one-third smaller than 1470. Now let’s do a simple thought experiment on how we can interpret our new fossil 1470 with different dates associated with it. 1470 was found below a volcanic tuff called the KBS tuff. So it should be at least as old as the tuff. 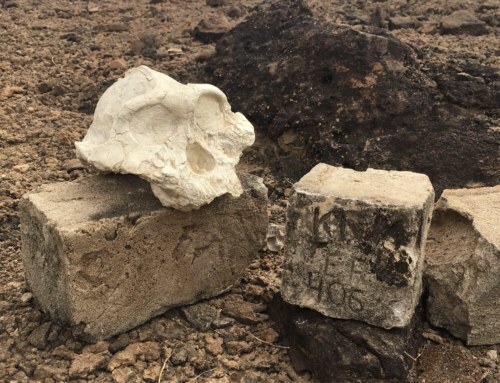 The first radiometric date of the KBS tuff was that 1470 is 2.6 million years old, which is much older than the earliest stone tools known in the 1970s. If so, did 1470 make stone tools? Should we put it in our own genus Homo even if it didn’t make stone tools? 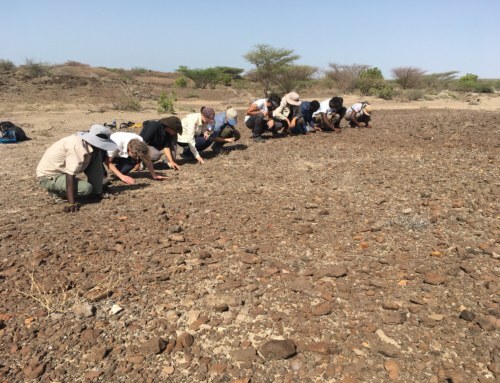 Or there are older stone tools that we haven’t found, yet? Did the later Homo erectus evolve from 1470? Now let’s think of another radiometric date say 1.9 million years old, which puts 1470 contemporary to Homo habilis and the slightly younger Homo erectus. If so, the biggest question would be who made the stone tools. What is the evolutionary relationship between these species? See how we can get a different set of questions and associated interpretations with a different date? 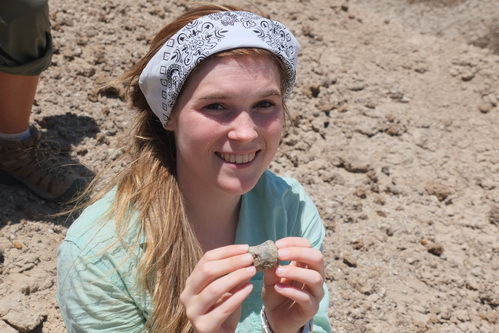 It turns out that the first date (2.6 million years old) was not correct! It is likely that the sample was mixed with other minerals. Interested in the questions associated with the second date? 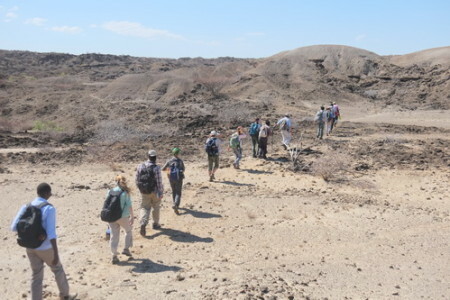 We will come back to them in our Human Origins module! 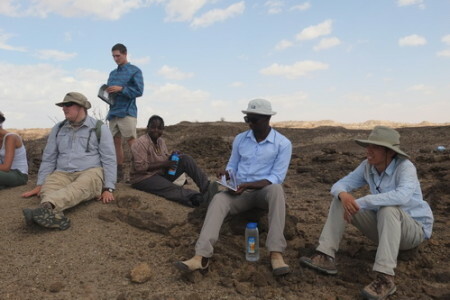 In our field expedition, Dr. Lepre took us to Area 105 where the KBS tuff was first found (FxJj1 archeological site). Then we headed north to Area 131 to see the excavation site of 1470. All the pieces of it have been collected and stored in the National Museum in Nairobi. 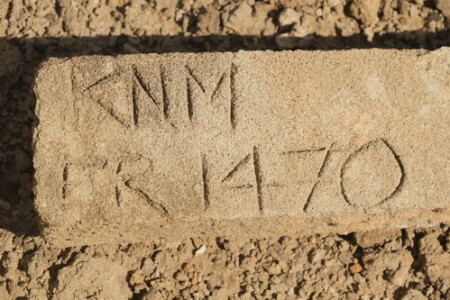 The only thing left is a concrete post with its accession number. There were some serious hikes that day but students really enjoyed it. Taylor and Maria find a small cave for shelter, while Pamela is totally left out! Meredith with the KNM-ER 1470 post! 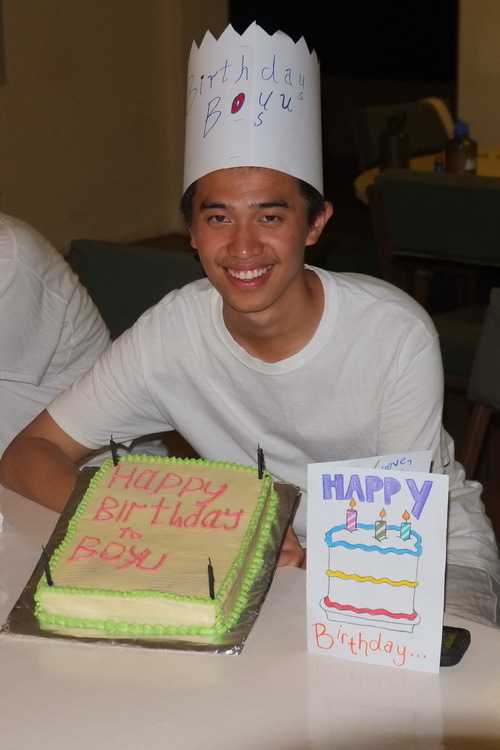 Yesterday, we celebrated Boyu’s 22nd birthday! Boyu received a crown, a birthday banner and a birthday card from all other students! And the birthday cake was awesome! 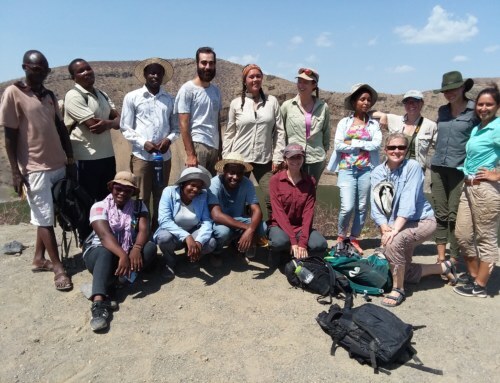 There are other birthdays coming up during the field school season and we will always have cakes and fun! Stay tuned for more!